It’s cute, it’s cuddly, and it’s oh-so adorable. Yup, those are the things that come into mind upon first looking at the bēm wireless Public Zoo Mobile Speaker. Sporting some lively looking Japanese and Korean character art around its sides, this cube shaped Bluetooth speaker has a certain colorful aspect that’ll undoubtedly attract those individuals who simply go bonkers over anything cutesy. Although it’s not original, especially when we’ve seen many other Bluetooth speakers employ that familiar cube-like shape, the biggest drawing factor here is the adorable art around its sides. Specifically, we find a few lovable characters that add an element of liveliness to the bēm wireless Public Zoo Mobile Speaker. Yes, you have a panda, a mouse, a couple of happy looking clouds, and some egg-shaped head dude with glasses – they basically give the speaker its wow factor. Thankfully, the construction is solid here, as the soft touch finish of the speaker helps to keep those characters looking spiffy. On the front surface, there are actually touch sensitive controls for volume up, down, and pause/play. In the rear, all the usual set of ports are found – these include an aux-in, aux-out, miniUSB port for charging its battery, and LED lights for its Bluetooth connectivity status and battery low level. All by itself on the bottom is the speaker’s physical power button. Pairing it to a Samsung Galaxy S4, we can instantly tell that the speaker’s output is stronger, which is aided by the amount of bass it’s pumping out as well. On one hand, we appreciate that it doesn’t strain at the loudest volume setting, but the audio quality seems a bit muddy compared to other things. Oh yeah, one of the uncharacteristic feature of Public Zoo Speaker is that it can start moving on its own when it’s placed on a flat surface – partly the bass’ fault. 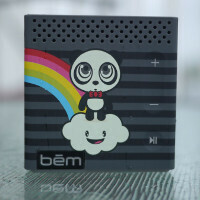 Priced higher than other comparable speakers, the $69.99 cost of the bēm wireless Public Zoo Mobile Speaker is primarily attributed to its adorable character art. We can’t say this is the best portable Bluetooth speaker, seeing that we’ve heard others that deliver better results at a lower price point. Regardless of that, if you’re looking to snag a speaker that’s different, errrr charming, then this might suit you.